Escape to a world of panoramic ocean views and luxurious comfort. 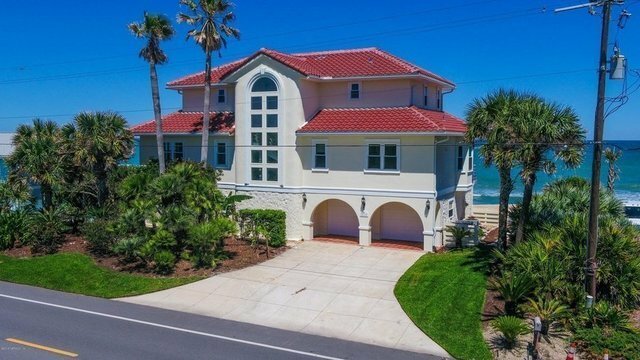 Gorgeous 3-story oceanfront home with solid concrete construction & NEW TILE ROOF. Gracious foyer has staircase leading to upper living area. The open floorplan makes entertaining easy. Breathtaking ocean views from almost every room. Enjoy the warmth of a fireplace in the living room on colder evenings. Walk into the kitchen which is a true showstopper and a chef's dream! You will love to cook meals or do dishes with these ocean and Guana Preserve views offering sunrise & sunsets! Have your morning coffee in the breakfast room or out on Terrace. Separate family and dining room.Private beach walk from back door. Attached garage leads into 1st floor offering 2 bedrooms. 3rd floor features master & secondary bedrooms. HURRY!